Remove the pie crusts from the package and let them come to room temperature. When the pie crust is at room temperature, roll it out and cut 6 circles out, big enough to fill a muffin pan and go up the sides. You'll want to cut the circles a little larger than the muffin pan so that the dough goes up the sides (it doesn't have to go all the way to the top, but it should go over halfway to the top). Fill the mini pie crusts with cherry pie filling, a spoonful or two. Make sure to get plenty of cherries! 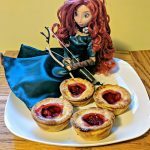 We put tops on our pies, cutting out a smaller circle so it looks like the magical "cake" from BRAVE. You do not have to add this second crust unless you want to. If you want the second crust, cut out six more circles (these ones should be about the size as the muffin pan) and cut a smaller circle out of the middle (so it kind of looks like a doughnut). Place the doughnut-looking dough on top of the pie crust filled with the cherry filling, pressing down on the sides so the two crusts connect. OPTIONAL: whisk an egg with 1 TBSP of water and brush the mixture onto the top pie crust, sprinkling with sugar. This will give the top crust a nice golden crisp. Bake for 14-18 minutes. You may want to check the tartlets after about 10 minutes to make sure they aren't burning. If they are getting too brown, cover the muffin pan with foil and continue baking.